Posted by Dave Emory ⋅ January 31, 2019Post a comment Email This Post Print This Post Tweet This! COMMENT: Yasha Levine’s recent book Surveillance Valley is a MUST READ! Relatively short and very much to the point, this volume–subtitled “The Secret Military History of the Internet”–chronicles the fact that the Internet is a weapon, developed as part of the same group of overlapping DARPA/Pentagon projects as Agent Orange. The Internet is a weapon, developed for counter-insurgency purposes. Big Tech firms network with the very intelligence services they publicly decry. Big Tech firms that data mine their customers on a nearly unimaginable scale do so as a direct, operational extension of the very surveillance function upon which the Internet is predicated. The technologies touted by the so-called “Privacy Activists” such as Edward Snowden and Jacob Applebaum were developed by the very intelligence services they are supposed to deflect. The technologies touted by the so-called “Privacy Activists” such as Edward Snowden and Jacob Applebaum–such as the Tor Internet function and the Signal mobile phone app– are readily accessible to the very intelligence services they are supposed to deflect. The organizations that promote the alleged virtues of Snowden, Applebaum, Tor, Signal et al are linked to the very intelligence services they would have us believe they oppose. Big Tech firms embrace “Internet Freedom” as a distraction from their own willful and all-embracing data mining and their ongoing conscious collaboration with the very intelligence services they publicly decry. We will develop this more completely and in much greater detail in the future. NB: Mr. Levine does not go into the fascistic character of Snowden, Assange, Greenwald et al. Some of those shows: Greenwald–FTR #888, Snowden–FTR #’s 756, 831, Assange and WikiLeaks–FTR #’s 732, 745, 755, 917. 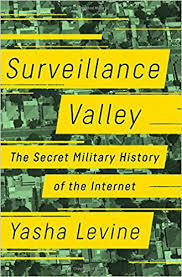 Surveillance Valley by Yasha Levine; Public Affairs Books [HC]; Copyright 2018 by Yasha Levine; ISBN 978-1-61039-802-2; pp. 267-269.
. . . . Convoluted as the story may be, US government support for Internet Freedom and its underwriting of crypto culture makes perfect sense. The Internet came out of a 1960s military project to develop an information weapon. It was born out of a need to quickly communicate, process data, and control a chaotic world. Today, the network is more than a weapon; it is also a field of battle, a place where vital military and intelligence operations take place. Geopolitical struggle has moved online, and Internet Freedom is a weapon in that fight. If you take a big-picture view, Silicon Valley’s support for Internet Freedom makes sense as well. Companies like Google and Facebook first supported it as a part of a geopolitical business strategy, a way of subtly pressuring countries that closed their networks and markets to Western technology companies. But after Edward Snowden’s revelations exposed the industry’s rampant private surveillance practices to the public, Internet Freedom offered another powerful benefit. Silicon Valley fears a political solution to privacy. Internet Freedom and crypto offer an acceptable alternative. Tools like Signal and Tor provide a false solution to the privacy problem, focussing people’s attention on government surveillance and distracting them from the private spying carried out by the Internet companies they use every day. All the while, crypto tools give people a [false] sense that they’re doing something to protect themselves, a feeling of personal empowerment and control. And all those crypto radicals? Well, they just enhance the illusion, heightening the impression of risk and danger. With Signal or Tor installed, using an iPhone or Android suddenly becomes edgy and radical. So instead of pushing for political and democratic solutions to surveillance, we outsource our privacy politics to crypto apps–software made by the very same powerful entities that these apps are supposed to protect us from. In that sense, Edward Snowden is like the branded face of an Internet consumerism-as-rebellion lifestyle campaign, like the old Apple ad about shattering Big Brother or the Nike spot set to the Beatles’ “Revolution.” While Internet billionaires like Larry Page, Sergey Brin, and Mark Zuckerberg slam government surveillance, talk up freedom, and embrace Snowden and crypto privacy culture, their companies still cut deals with the Pentagon, work with the NSA and CIA, [and companies like Cambridge Analytica–D.E.] and continue to track and profile people for profit. It is the same old split-screen marketing trick: the public branding and the behind-the-scenes reality. Internet Freedom is a win-win for everyone involved–everyone except regular users, who trust their privacy to double-dealing military contractors, while powerful Surveillance Valley corporations continue to build out the old military cybernetic dream of a world where everyone is watched, predicted, and controlled. . . . This article talks about how the Koch Brothers heavily invested in Computer systems and analytics and AI to use available political and consumer information on 89% of the population. They use predictive modeling from the 1800 unique pieces of information on each individual. The information is categorized in a strength score (1-10) that is used to create an individual personality profile. This profile is then categorized in a specific group for either consumer marketing or political message targeting depending on the objective. In political targeting they will send messages through that users most popular medium – internet purchasing, e-mails, or Cable TV and send adds with the political messages that will be most likely to influence that person and/or their spouse. The computer software/analytics company, i360 has had extensive long term funding by the Koch Brothers who more than reap the political benefits of their messaging to support their candidates. The Koch Brothers supported politicians get the benefits of this research and databases for below-market pricing so they can target voters with specific adds accordingly. The Republicans have benefitted from this. As have the Koch Brothers and their allies energy interests who, although not explicitly stated in this article support deregulation as they attack the EPA so that their profits are increased. T]he issue of opioid abuse was particularly complex in that it was relatively unknown whether it was considered a healthcare issue or a criminal justice issue. The answer to this would dictate the most effective messaging. In addition, this was a particularly personal issue affecting some voters and not others. The pre-planned, “self-made” billionaire Jeff Bezos – world’s richest man.